ORIGINAL PURPOSE: This was a joint project with my friend Toni no-blog. It was for the Kansas City Star “Patterns of History” contest that was part of the 2005 Spring International Quilt Market in Kansas City. REASON FOR NOT FINISHING IT: We missed the deadline for the contest, and it fell by the wayside as other projects of interest came along. 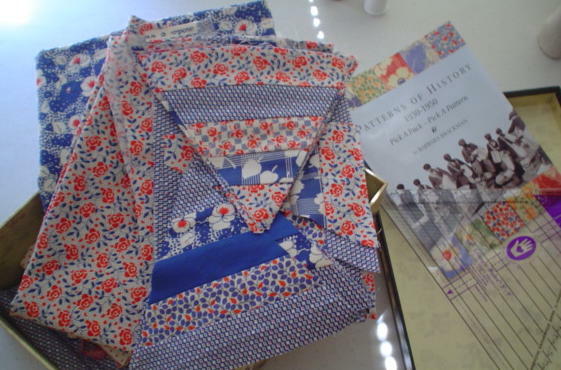 PLAN FOR FINISHING IT: I always liked this quilt, the pattern we designed, the fabrics, love it all! I need to count how many pieces we did get put together, and determine what needs to be done next. Probably assembling the quilt top and adding some applque to it. Toni and I did attend the Quilt Market that Spring, and saw the winning entries. We truly regretted not finishing the quilt, we felt we definitely could have competed strongly with the other entries. one of the things I find great about this whole blogging thing is that it has made me become aware of some of my projects that have fallen by the wayside..and by posting about them it makes me want to finish them and it gives me a sense of satisfaction – so its all good! Love the look of your project – keep the updates coming….or should that be “cupcakes” …. Linda over at All Stitched up has made a start on her cupcake swap and the colours are great….